Happy New Year! I hope you are off to a great start! This year marks 5 years since I began the “Poem of the Month” feature on my website. I’m so excited about the growth over the years and I look forward to sharing more poems to inspire and motivate you in the years to come. Thank you for your support! 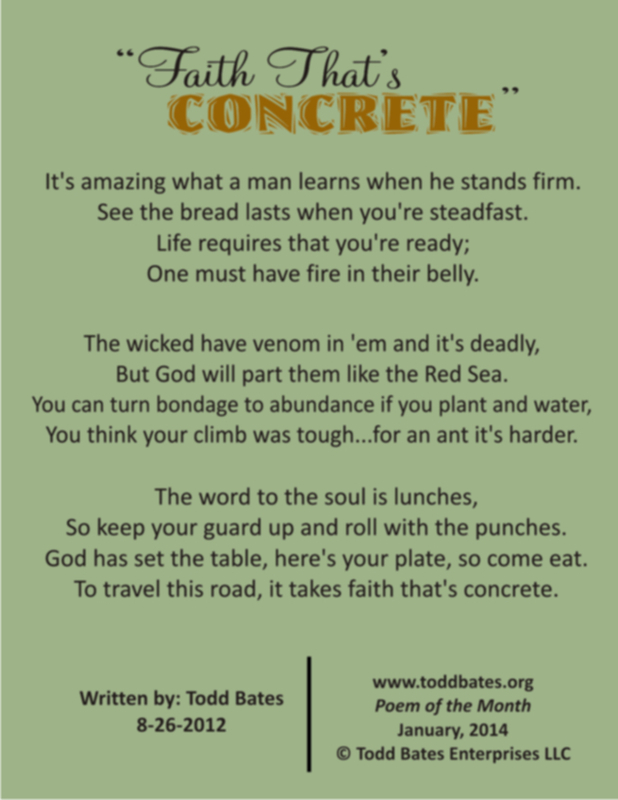 This month’s poem “Faith That’s Concrete” is below. Remember you can always see past “Poem of the Month” features under Poem Archive. It’s amazing what a man learns when he stands firm. See the bread lasts when you’re steadfast. One must have fire in their belly. But God will part them like the Red Sea. You think your climb was tough…for an ant it’s harder. So keep your guard up and roll with the punches. God has set the table, here’s your plate, so come eat. 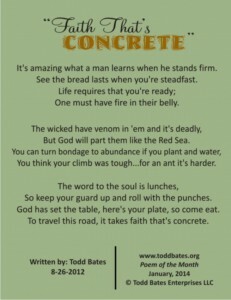 To travel this road, it takes faith that’s concrete. Say Hello to the family for me.